Students learn about the prevalence of plastic in our environment and how we can help even by making a sculpture out of a plastic water bottle. We discuss environmental issues, reusing, and recycling by making a sea creature while thinking about how to clean up the ocean. Target Learning: Shows understanding of cutting a cylinder form into equal parts. Criteria: Cuts off bottom of bottle, and cuts into upper part of bottle to create eight or more same sized legs. Target Learning: Cuts and folds bottom of bottle into equal parts. Criteria: Creates flower-like form divided into same sized pointy petals. Target Learning: Creates unique 3-dimensional Jelly creature. Criteria: Connects the two bottle pieces with a knotted string, adds color to make the jelly an individual, and curls and/or cuts legs into points. Target Learning: Understands ways to reduce our use of plastic. 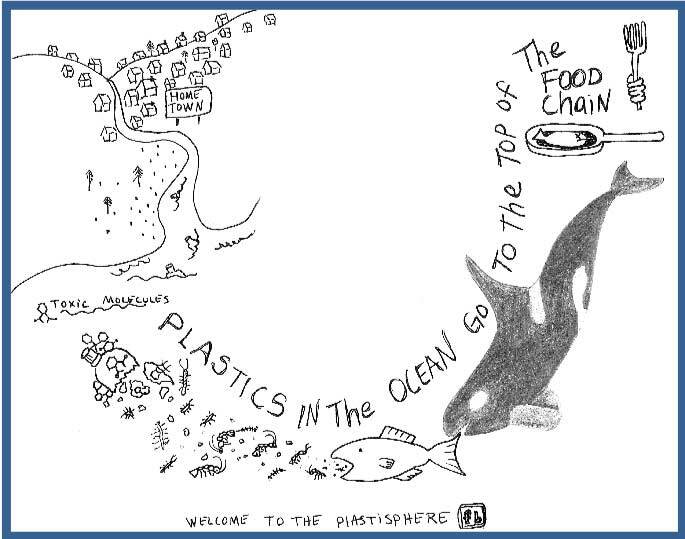 Criteria: Describes examples of how we can reuse and recycle plastics in our daily lives to help protect our oceans. Plastic water bottles with small holes drilled in the bottom and the lid. String to hang the Jellies: May be pre-knotted or have a bead tied on end. Students talk about the marine environment: what is it? Do you ever see things on the beach that should not be there? Discuss garbage: what exactly is the most common kind of garbage? Do you know about the great floating garbage patch? How did it get there? Review the image and the words about the food chain. Step 1: Squeeze the bottle a little to cut off the base. Step 2: Cut a line up toward the top, straight or a little curvy. Turn the bottle over and cut at the same angle as the first line. Now you have two halves, cut those in half and you have four. Now cut the 4 to get 8. You may continue cutting to get even smaller legs that will have more movement in the air currents and be easier to curl. Step 3: Using the bottom piece, cut into equal parts. There are usually dented lines to follow that vary by brand name, some have as few as three and as many as 8. Fold the corners: at each, cut toward the center to make a point. Step 4: Either tie a knot in your string or tie a bead on one end. 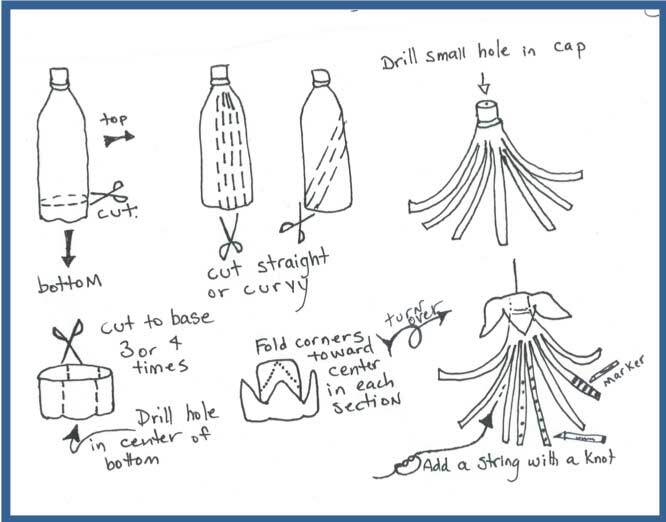 Remove the cap from the bottle and put a string through from the inside out, with the long part coming out of the top. Recap the bottle and add the star/flower shape to the string. Step 5: Creatively add color to enhance your jelly as a unique individual, consider if it will have either warm or cool colors, or a mix. Add stripes or polka dots. Make the legs curly. Did you make a unique Jelly? Did you consider the color scheme in the final sculpture? Describe. How is your Jelly different than others around you? Is it symmetrical or asymmetrical? Does your jelly have movement that looks organic or kind of alive? Does it have a name? How can we reduce the use of plastic in our lives so we can reduce plastics going into the ocean? Performance Standard (VA:Cr2.1.1): a. Explore uses of materials and tools to create works of art or design. Performance Standard (VA:Cr2.3.2) a. Repurpose objects to make something new. Anchor Standard 5: Presenting: Develop and refine artistic techniques and work for presentation. Performance Standard (VA:Pr5.1.2) a. Distinguish between different materials or artistic techniques for preparing artwork for presentation. Performance Standard (VA:Re7.2.1): a. Compare images that represent the same subject. Anchor Standard 10: Connecting: synthesize and relate knowledge and personal experiences to make art. Performance Standard (VA:Cn10.1.2): a. Create works of art about events in home, school, or community life.